All species of snake in this country are protected by law. They are not as dangerous as people think, but nonetheless they can still be frightening. There are three native species of snake in this country: the Adder, the Grass snake and the Smooth snake. All three are protected under the Wildlife and Countryside Act. It is illegal to kill, take or injure them by any method. 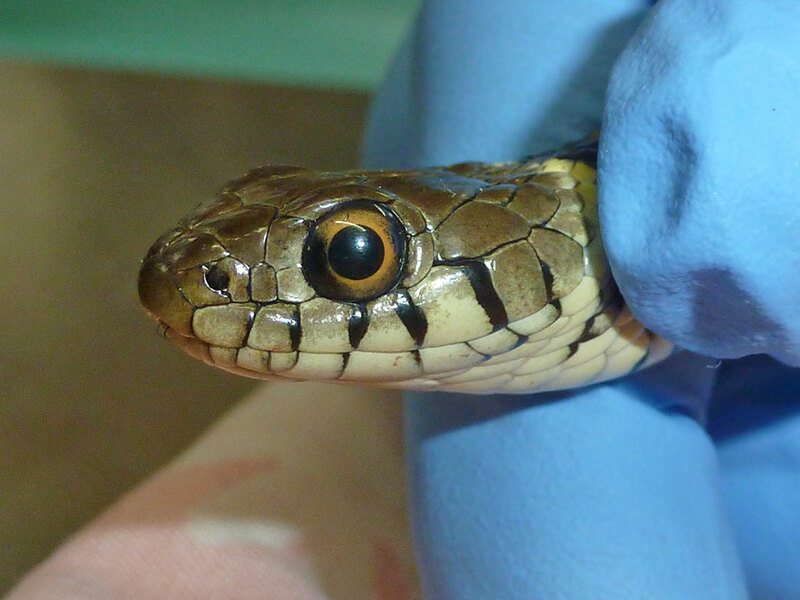 It is worth noting that Grass snakes produce a foul smelling liquid when handled or captured which is difficult to remove from clothing. Once covered you will want to change your clothing! It is common for snakes to become caught in netting in gardens or over ponds. They twist themselves round and become more and more tangled. Do not release the snake straight away. It will need to be checked over for wounds and taken to a veterinary surgeon for antibiotics and other treatment. Ligature wounds need to be monitored for thickening of the skin, if this develops seek veterinary help as soon as possible. The snake should be placed under observation for at least 24 hours. If there is a reptile rescue organisation in your area pass the snake over for them to deal with. Many people are frightened of snakes and panic when finding one in their garden. Many people assume that it is the first time they have had a snake in their garden. It is more likely they have always been around but just not been seen. Snakes cannot be picked up and relocated as this would be an offence under the Wildlife and Countryside Act and the Abandonment of Animals Act. Many people mistake Grass snakes for Adders. The Grass snake has a yellow "V" on the back of his head. The Grass snake varies in colour from a grey/green colour to a dark black/green colour with some darker almost black marks down its back. They prefer the damp and wetter areas of our countryside and like ponds and streams. It is normally the male Adder that is seen sunning itself in dry areas. The male Adder is light grey in colour with a diamond or zigzag black mark down its back. The female is normally an orange/red or brown colour with a slightly dark shade of diamond or zigzag markings down its back. The Adder is thick and short whereas the Grass snake is thin and long. Anyone experiencing problems with snakes in their gardens should contact their local amphibian and reptile group via Froglife. It can also be found via your local Wildlife Trust or library. Only the Adder is poisonous. However, the poison is not very strong. Humans are more likely to have an allergic reaction from the bacteria on the snake’s teeth then from the poison carried. All bites should be checked over as soon as possible by a minor injury unit or hospital A&E department. However, smaller animals like dogs and cats can be affected and should seek veterinary help as soon as possible.